Radio Frequency (RF) energy, in the form of radiating waves or electrical currents, used in medical treatments for over 75 years, generally for minimally invasive surgeries using radiofrequency ablation. Radio Frequencies at non-ablation energy levels commonly used as a part of aesthetic treatments that can tighten skin, reduce fat by lipolysis and apoptosis, or promote healing. Radio Frequency energy is a form of electromagnetic energy. Radio Frequency current through tissue will generate heat in the tissue. 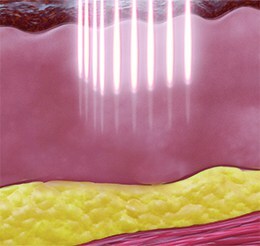 This source of heat has extensively used in surgery for hemostasis and tissue ablation (electro-surgery), but more recently it has been applied as a means of shrinking redundant or lax connective tissues through the mechanism of collagen denaturation. Collagen molecules are produced by fibroblasts. Heated fibroblasts are also implicated in new collagen formation and subsequent tissue remodeling which can also contribute to the final clinical result. The precise heat-induced behavior of connective tissues is dependent on several factors which include the maximum temperature reached, exposure time, tissue hydration and tissue age. 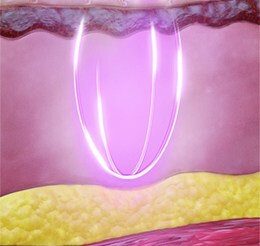 TriPollar® technology, available in the Legend Pro™ skin treatments’ platform, is a unique third generation RF technology that builds on the advantages of its predecessors to result in an improved and more refined version. RF runs through three or more electrodes, that change their polarity during treatment for more homogeneous coverage and improved thermal effect. The polarity ratio is always two to one: two positive and one negative, and vice versa. This rotating polarity means more homogeneous heating of the tissue from within, keeping the epidermis safe. Thanks to this RF modality the risk of burns and blisters is minimized. On the Legend Pro™ platform, applicators no1 and 2 are equipped with an Infra-Red (IR) sensor for real-time, in-motion milliseconds temperature reading precision that ensures treatment endpoint and efficacy. There is no need for skin cooling and treatment is easy to perform. TriPollar® treats facial wrinkles and rhytids. Results are immediately visible from the first treatment and may last for several months before touch up and maintenance treatments are required. TriPollar® RF is ideally combined with VoluDerm™ precise micro heating through Legend M² ™combination therapy. The two technologies target different skin layers individually and synergistically in a single procedure.